Hand held, light weight, stand alone device designed for use with VW, Audi, Seat and Skoda vehicles, this self contained unit reads and resets fault codes and warning lights. 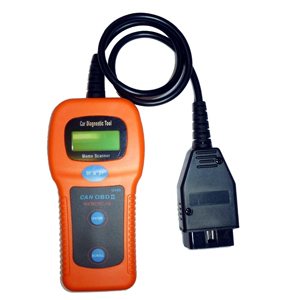 Easy to use, supplied with full user instructions, no batteries required, completely self contained, stand alone unit that plugs straight into the vehicle diagnostic socket. Fault codes listed in reference manual, reset codes and turn off warning lights with the push of a button. On some vehicles an error connection is displayed and the scanner is limited in what it can adjust / scan. We are currently aware of an issue with the Skoda Fabia 1.4 Greenline and 1999 Golf 1.4s Mk 4.